Everything from a 2+1 (2 mens cubicles + 1 womens) to a 4+2 and everything inbetween. Toilet units come in all shapes and sizes - no matter what size you need and how desperately you need them - we'll supply anywhere in the UK - quick enough that we guarantee you won't be crossing your legs for very long. 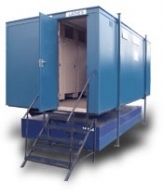 If you're only looking for a single portable chemical toilet such as the one's you see at events, we can supply those too - just check out our hire section or if you're really desperate just give us a call and we'll sort one out - often on the same day. We really do understand how important it is to get these things sorted quickly and efficiently. Call us now on 0800 408 1484 before it's too late!